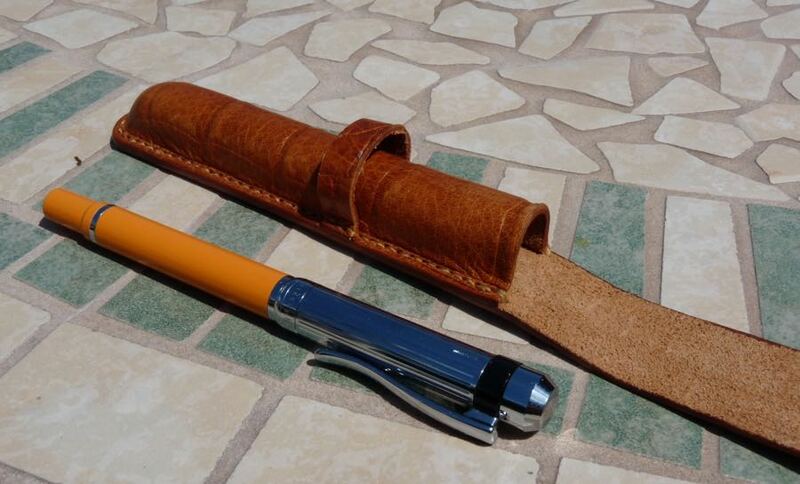 Tom Barrington Leather Pen Holder Review – Pens! Paper! Pencils! 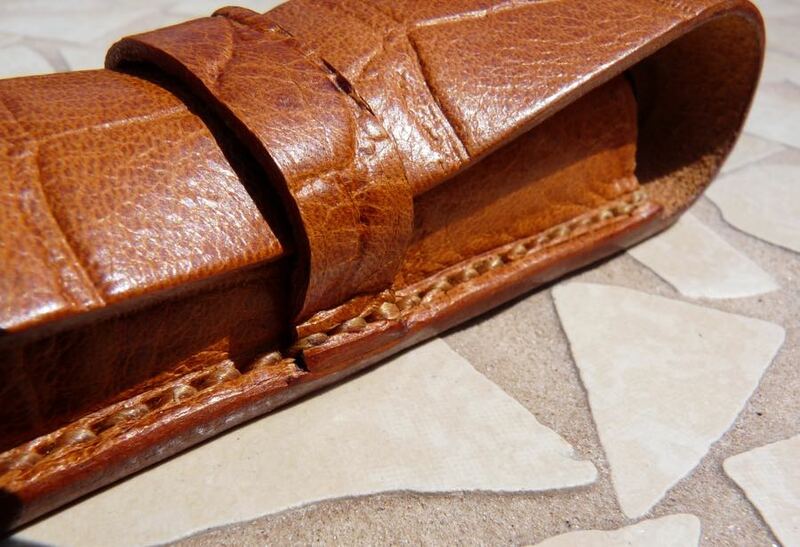 Tom Barrington makes a whole lot of leather pen sleeves and holders. All are handmade. 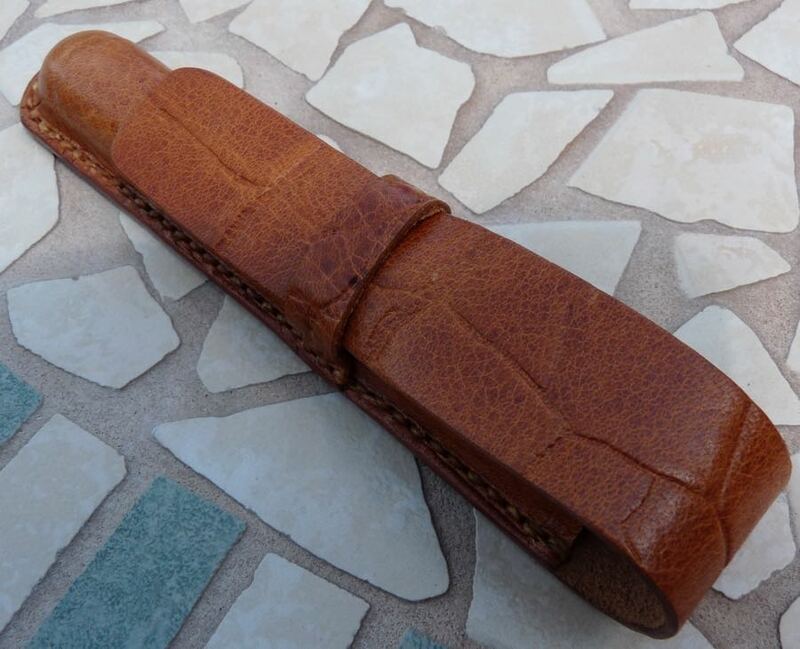 The one I’m reviewing, a single-pen tan crocodile-grain holder, costs $24.95 but was sent to me for review purposes by Tom Barrington. At the time of writing only crocodile-grain is available, which isn’t quite my cup of tea, but it’s popular so I expect I’m in the minority here. There are plans for plain versions to be available soon. The leather is fairly thin and doesn’t feel as high quality as say a One Star Leather sleeve but then it costs half as much. It’s good for the price. This holder was handmade and has been stitched to a high standard. I’m no expert but I’ve compared it to other items and it holds up well. I’ve taken it on my travels here and there and it’s showing no signs of imminent fraying or untimely undoing. I tried my biggest pens in this holder and it was big enough for all of them. I don’t have anything like a Pelikan M1000 so couldn’t test it with that kind of monster. I understand that it may be hard for me to talk about whether something is good value or not when I’ve not paid for it myself. However, value does need to be considered. This isn’t the best pen holder or sleeve that money can buy, only because of the quality of the leather, but it’s well put together and it’s relatively inexpensive. 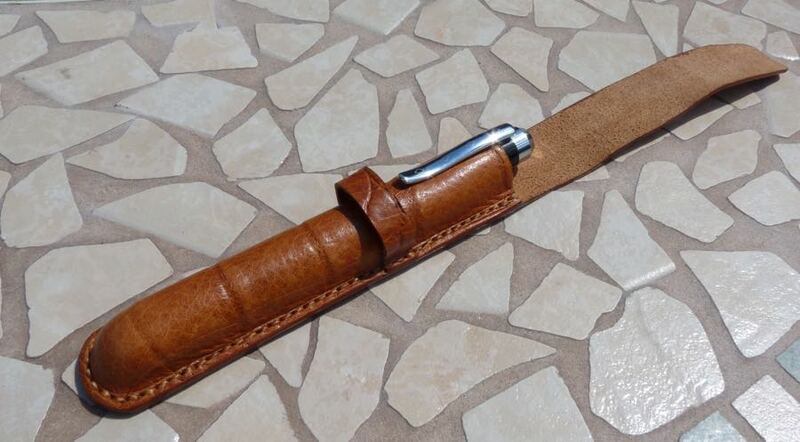 If you’re in the market for a leather pen holder and don’t want to spend too much, Tom Barrington is worth a look. Thanks Ian for the review I have not heard of Tom’s stuff. I don’t have a real use for a single pen case as I’m afraid of a panic attack if I left the house with just one pen! I know what you mean! I use mine to keep my Star Trek logging pen in, on my desk. Probably best I don’t try to explain that. They do two and three pen holders too, though.